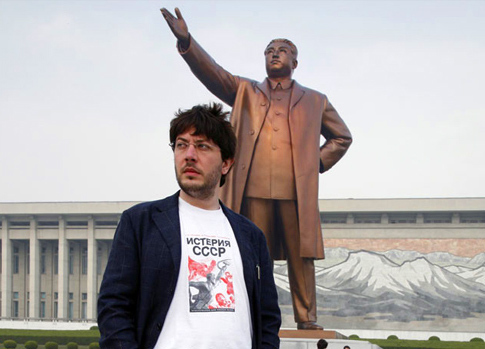 Want the inside scoop on the North Korean music scene? Check out this this fascinating series of articles by the Guardian collectively titled Pyongyang goes pop. 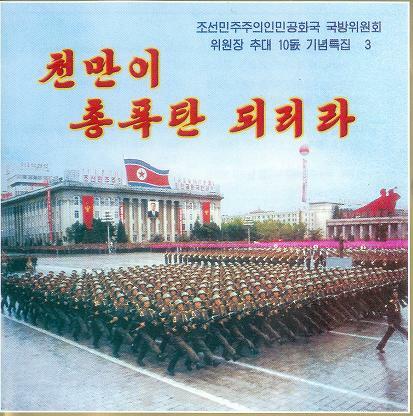 Related: Music for Maniacs offers an entire album's worth of North Korean tunes. Pyongyang Painters is one of the stranger art sites I've encountered. 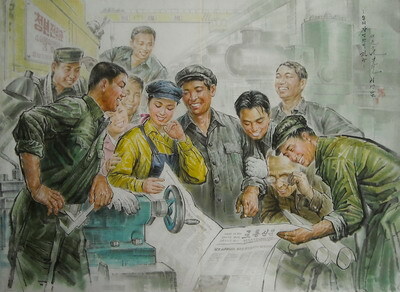 It features "beautiful original paintings from the Democratic People’s Republic of Korea (DPRK)." The site is hosted in the US. Only accepts bank transfers and is run by Felix Abt a Swiss North Korean affairs specialist. The site says it included: "Novelties", "Stories about the artists", and "Information on the great skill of North Korean artists." I've seen Noko Jeans links floating around for a few years but always thought they were some sort of joke. Apparently not. 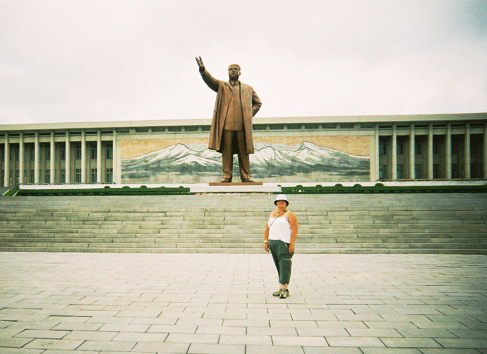 Clicking through to the website shows candid video and images from the DPRK. Every time I see video from there it reminds me of China in the mid 80's. The whole enterprise is odd/fascinating and could easily be mistaken for an art project. "You do know, you should remember Ji-Hyon ah – love flows down. From person to person it only trickles down." I tell her I’m not sure I understand. I’d never heard this saying before. "It’s an old Korean saying. This is one of the ways we understand love. It moves downward, from grandmother to mother, from mother to child – this is how we take care of each other. But the one below will never understand the love of his parent so he cannot love as much. Love is always greater on top. And so is the pain." 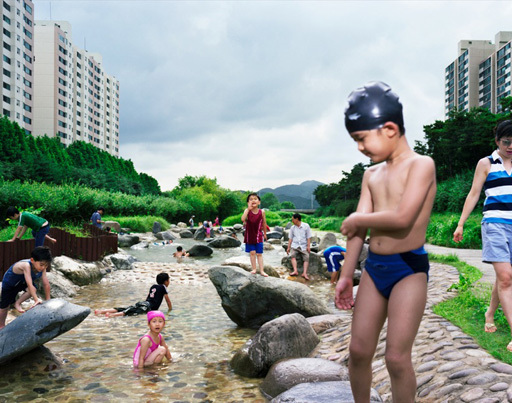 Ian Baguskas who I've linked on this site before and who has worked with us at 20x200 has a nice series of South Korea portfolios worth checking out. My favorite of these is titled Haenyeo. Haenyeo translates as 'sea women' and is the name used for the female divers of Jeju Island. 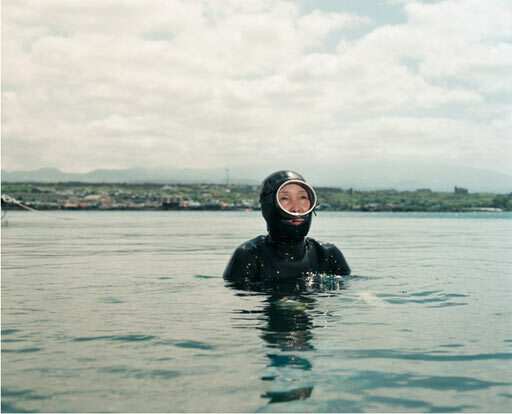 For about 3 centuries these ladies have been diving up to 80 feet to collect octopus, abalone, and sea weed and until recently drove the economy of this island known for it's many rocks, winds, and women. Korean tourism promotes the haenyeo as mermaids but it's a a hard scrabble life and partially because of this, their numbers are declining precipitously. Only around 5200 are thought to be left, down from 20,000 in the 1960's and 40,000 in the 1930's. More than half are in their mid-60's. Are You Me? (03 Hangul) from aufdemweb on Vimeo. My wife's cousin Erica is a video artist. I love this video which is part of a set video poems between herself and the artist Xana Kudrjavcev-DeMilner. 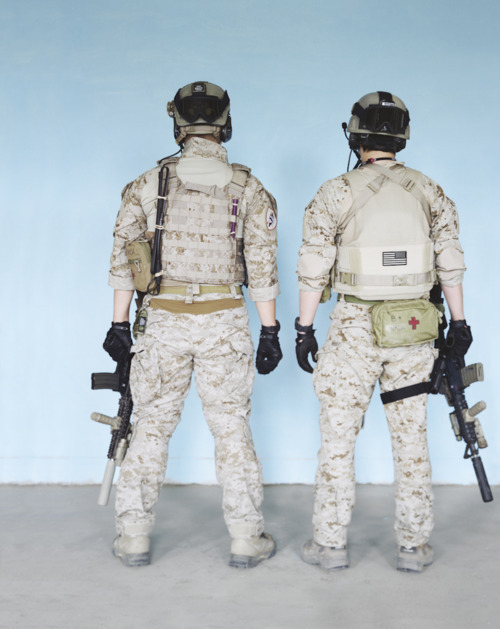 Seyeon Yun is a Yale MFA student with several knockout projects. Incomplete Journey is a astute wander through Korea... The portfolio is split into three chapters and, as the title suggests, it feels that more chapters are on the way. Homecoming is an equally powerful project delving into the lives of war veterans. 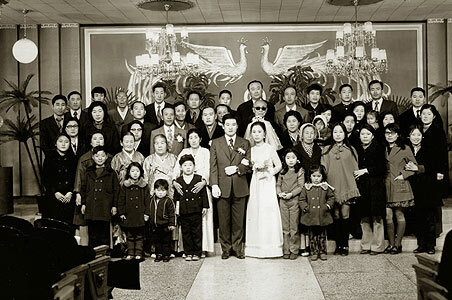 Yun is part of the Yale MFA group show at Danzinger Projects opening on May 27th. God loves you and God is blessing you all. Pray things. You are always in my heart. 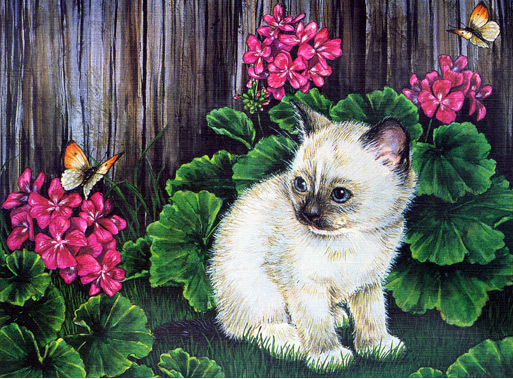 This cat reminded to me of you when you were 3 years old. Childhood. You were so quiet and clever, smart! Happy Birthday! "You are soooo lucky. Your new baby will be a pig. Not any pig, special red pig, once every 60 year pig! Jenny is cow. I am mice. What year were you born....? 1967? Hmmm. You are sheep. Oh sheep not so good.... but you are lucky to have pig baby soon. I told people in my church and they say you are full of blessing. Some Koreans think pig year is so good thing they have two babies in one year. Really. Pig people get a lot of property, money. Everything. They are sooo lucky." The man on the right is my wife's haraboji (grandfather). 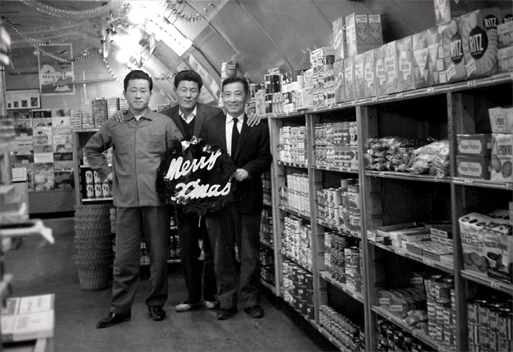 The date on this snapshot leads me to believe it was taken in Vietnam at an on-base store. Maybe it was meant to be sent back to Korea as a holiday greeting. Haraboji had 5 daughters before he producing a son. Jenn's mom is the third daughter. The entire family moved to the states a few years after this picture was taken. He is now in Philadelphia where he lives very close to four of his daughters (his wife died 3 years ago). A more patriotic American you will not find although his dream is to go back to the village where he grew up. 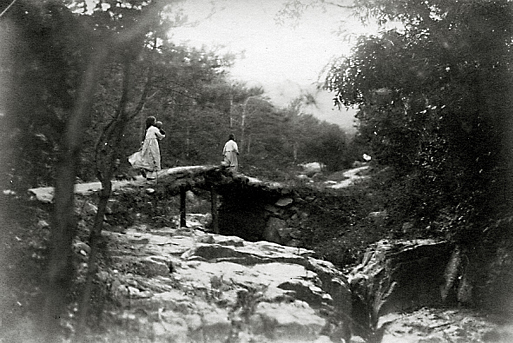 "My house was made of wood and looked out at the mountain. Very beautiful house." he says, "I dream about my village. We will go back soon... after North Korea is finished. I want to see my house." My brother-in-law Paul carries his dad's face. But his dad died when he was three and Paul has almost no memory of him. My wife who is six years older than her brother remember Paul chasing other toddlers around the coffin and laughing at the funeral in the happy unawares of childhood. I used to look at Paul wonder what it feels like to carry your dad's face when you didn't know him, but now that I am a father myself I think of it from the dad's perspective. Did he know his son would look like him, have his personality, his laugh? How sad that he never knew Paul, especially when Paul turned out to be such a good guy. 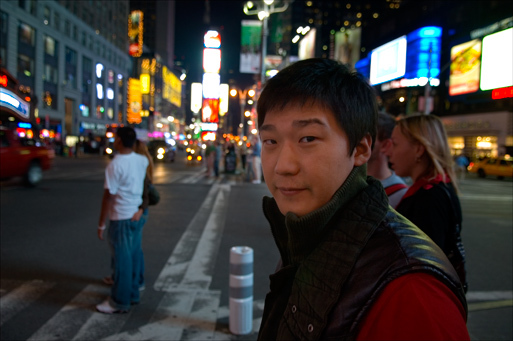 Mr. Yun would have been proud. 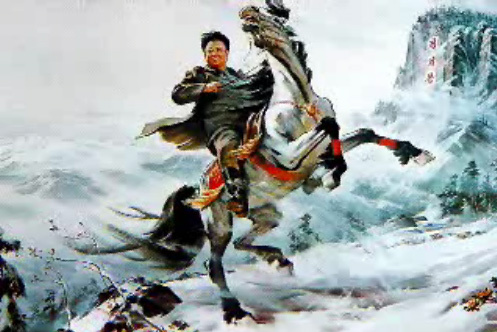 Tadspot has collected several North Korean Propaganda films from youtube all in one place. Mrs. Yun: Franz was ok.
Jenn: Come on mom you never liked Franz. You said you wished he would die because he looked "like man". Mrs. Yun: Ok. Ok. I'll tell you. It's like this. In Korea people think cat has bad spirit. . . Actually all Korean people hate cat. Mrs. Yun: Never sleep under fan. Sleeping under fan you can die. [she's a great believer of fan death] So terrible to die because of fan sleeping. Me: It's really hot here again. Mrs. Yun: Well you know, 'end of world' time. Anything is possible. Better go to church. What if you are left behind? Weather too hot! Becky: Mom, Wrinkle jinkle isn't a word. Mrs. Yun: (long pause) Then what is a jinkle? Becky: If you could be any animal for a day which animal would you be? Becky: It's a game, just pretend. Mrs. Yun: Oh I know. Poodle. Mrs. Yun: Because no one is mean to poodle. They give good food and brush hair and put ribbon in. It's nice. Mrs. Yun: What kind of movie is this?" Becky: It's Godfather. It's about gangsters. Mrs. Yun: It's not about God? Becky: No mom, that's God the Father, this is the Godfather. Mrs. Yun: Raul. You should come to see play. It's amazing. There are animal and Jesus is flying. Mrs. Yun: He is flying so much. 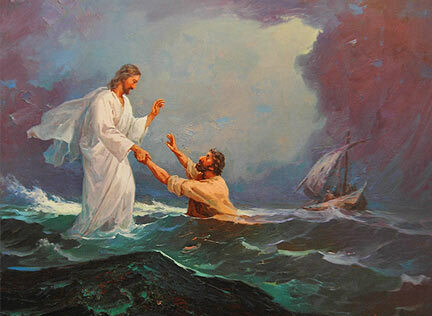 Jesus can do anything. My brother-in-law Paul has once again come up with some links to North Korea snapshot galleries. 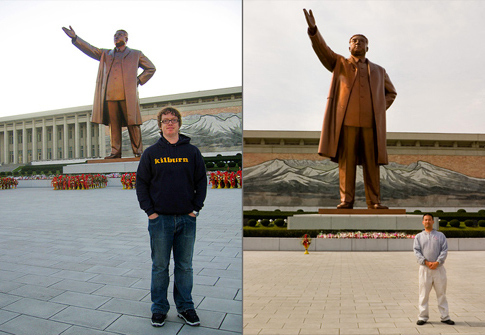 There are several good DPRK sets on flickr: Matthijs Gall, Mark Wang, Veronica Pinter. nuwex, prime8z, Fraser Lewry, Liz Ralph, John Goodman, and staypuff. And finally blogger Daniel Shorr's pictures and blog account of a recent trip. (in the blog archive scroll down to the bottom and work your way up). I hope to do some photography there in the relative near future. 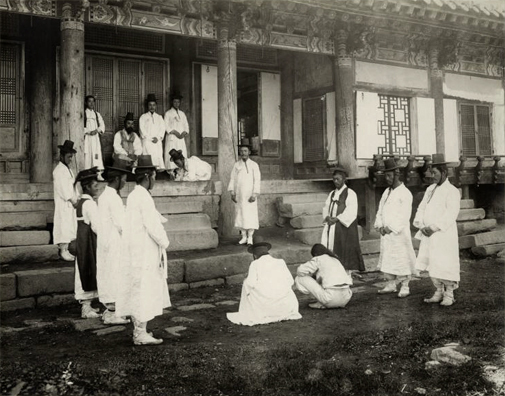 As I'm on a digital archive kick, check out these early Korea photographs from the New York Public Library's digital gallery. I found them while doing research for my wife's secret web project. 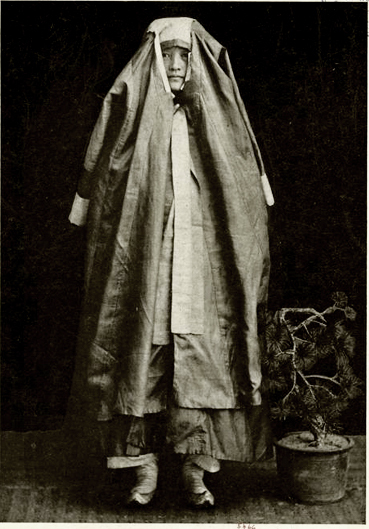 The first is labeled "Woman's correct street costume-1906". The second is labeled "trial" with a date in the 20's although it looks to be earlier. A FAQ about North Korea from the official DPRK website. 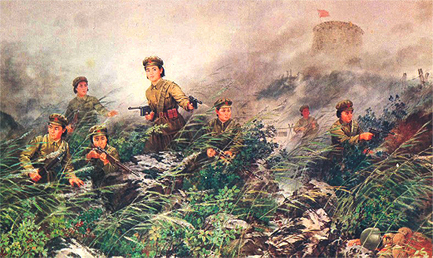 My favorite question (because it implies people are asking it): Q: Can I join the Korean People's Army? A: No, only Korean nationals with DPRK citizenship Also interesting the FAQ is dated "Juche 94". The site also features CDs by the People's Army Chorus for sale. North Korea Stock Photography - These basically cover all the stops on the official tour. 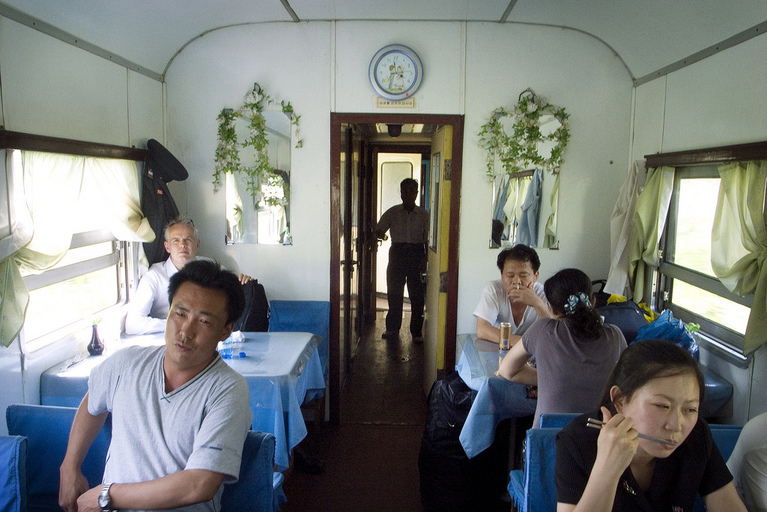 A North Korean Travelogue Collection. This is Jenn's grandfather in a photo from this date, October 20th, 1958. 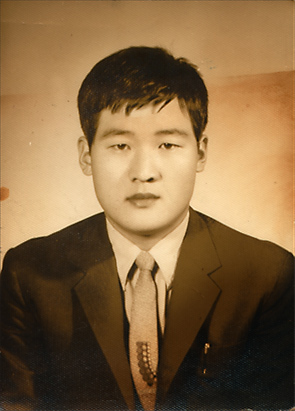 He was a translator in the military (both Korean and American) for much of his young life before emigrating to the states in the 70's. He looks pretty much the same today, a bit smaller perhaps, but the same bearing. He misses his wife terribly and talks to her every time he visits her grave. Breaks your heart. 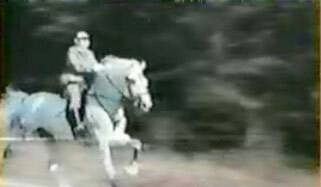 Yes that's Kim Jong Ill on horseback. I should explain. I was googling information on The Bern Institute for Xylophonics when I came across some fascinating quicktime movies from North Korean TV: Mo Kin, 3 year old "genius" plays the xylophone, Mo Kin sings!, Kim Jong Ill's Roses, Potato Pride, & North Korean High School Girls. All these videos are from the Roppongi Video Happy Hour a wacky variety show in Japan. There are more videos both North Korean (including the horseback one) and Japanese (some very very silly) available on the main robpongi thumbnail page. I never found the page Xylophonics institute, if you can track it down, drop the url in the comments. Longtime readers will know I have a bit of a North Korea obsession. Official North Korean News Agency (which oddly always includes a few items in Spanish). Downloadable North Korean Magazine (pdf format). and on an unrelated note, I just downed an entire box of melba toast. My brother-in-law Paul who is in Seoul sent me this link to some interesting North Korean comics today. Browsing around led me to this link with North Korean propaganda posters. I've long been fascinated with Communist propaganda and have been collecting Chinese posters for years. If you want to kill some time, check out Stefan Landsberger's vast collection of Chinese Propaganda Posters. Stefan wrote the book (literally) on the subject. His collection contains images that will blow your mind. 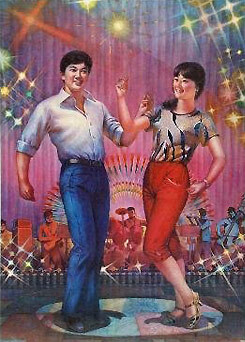 I used to have this image on my old website with the caption, "fun for you and your lady" it's from a Chinese poster (1980's). With fatherhood impending, I've found myself thinking quite a bit about Jenn's dad. He died young of a heart attack when Jenn was a kid. At the time of his death he wasn't much older than I am now. We don't have many photos, but in his formal portraits he always seems to be chaffing a bit in his suits, just suppressing a smile. 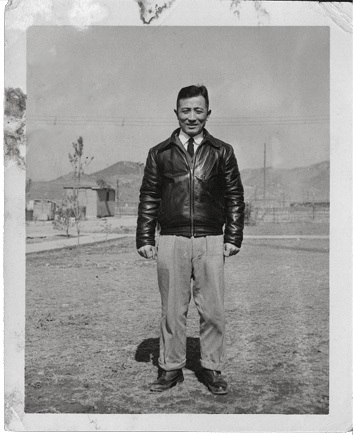 By all accounts he was funny, hard working, and tough--a devoted son and father who doted on his family. I regret his not being here, just as I regret the absence of so many of the others. 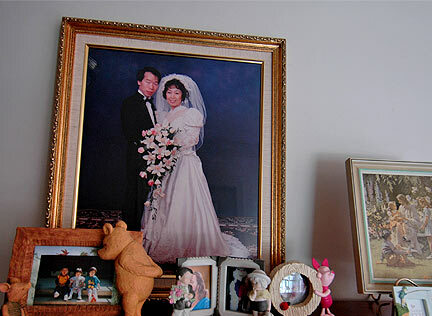 Every time I visit Jenn's family, I realize that at some point I will have to do a detailed photographic study of the homes of Koreans of a certain age. The homes tend to be in planned developments, and they tend to be both super Korean and unmistakably American in ways that are weird and wonderful. Framed jigsaw puzzles of the Last Supper. Poo bear merchandise and koo-koo clocks feature prominently. 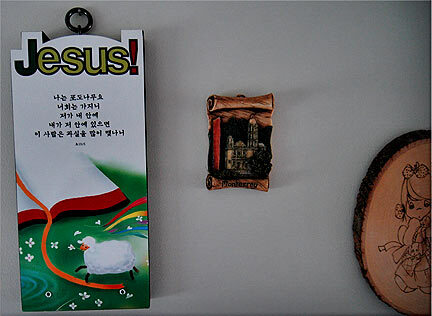 Also it seems that every house must have a Jesus calendar (usually a year or two out of date) with almost surrealistic imagery. These calendars are usually found on the back doors of bathrooms. My Mexican family has similar calendars although they tend to feature saints and tend to be five to ten years out of date.